What makes Riomaggiore unique is that it was built on a river gorge, hence the name Riomaggiore - "major river." The view from the pier is absolutely wonderful, surrounded by alabaster and marble and then a steep road that crosses the city center. 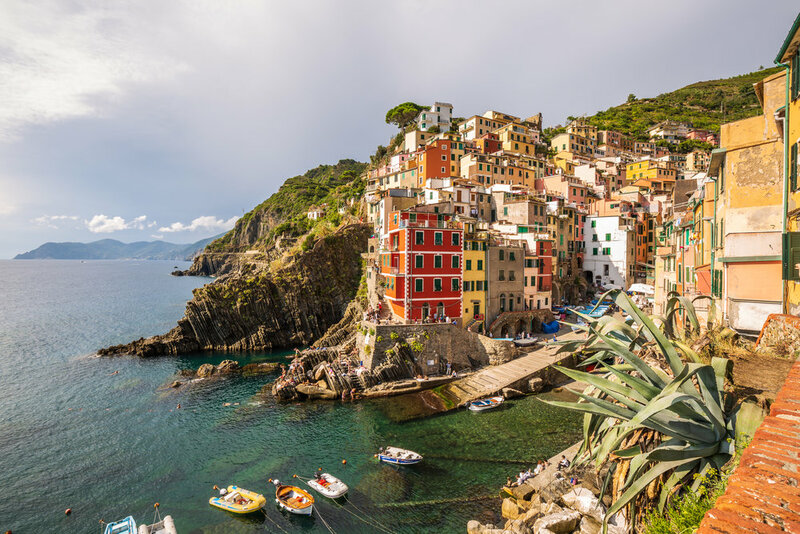 Riomaggiore retains an old-world fishing village charm, perhaps the most of the 5 villages, and is the perfect place kayak out for additional viewpoints. Manarola is unique as it was built on black rocks, and what makes it extraordinary is its vineyards and olive groves, therefore producing excellent wine and olive oil which can be purchased directly from the producer in local stores.The village is quite recognizable for its setting, with dozens of delightful little houses clinging to the cliff that descends to the sea. It is distinguished from other villages by its age, being the oldest of the Cinque Terre villages. It is also know for its "dark cliff," a particular stretch of coast that is always in the shade, given the mountains that loom over it, even at midday. Corniglia is located in the middle of the Cinque Terre and sits 100 meters above the sea. It is the only city without access from the sea. The small village is connected to its train station by a path known as Lardarina (377 steps). Corniglia is connected to the other villages of the Cinque Terre by well-kept paths managed by the park staff, making it the least crowded of the villages. Small cafes and lovely shops sell fresh orange juice, ice cream and other local treats. 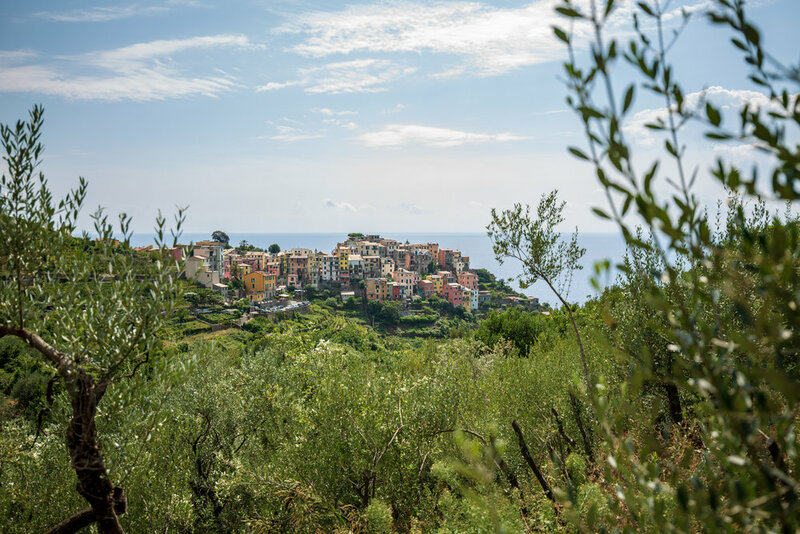 Corniglia is an ancient Roman village that boasts a long and rich agricultural tradition. In fact, the village is surrounded on three sides by vineyards and terraces. Its architecture is closer to that of a village in the rural countryside than that of a coastal village. The small fishing village of Vernazza is probably the most characteristic of the Cinque Terre and is classified as one of the most beautiful villages in Italy. Vernazza is the richest city of the area and the only one with a natural harbor, with the most elaborate architecture much made with marble. An ideal way to get to this breathtaking village is by the sea. The pier is surrounded by very steep terraced olive groves that are said to produce some of the best olive oil in the country. The charming square is lined with excellent restaurants and bars. In each of the villages, there are many shops that sell local specialties that can be purchased directly from those who produce them. Don’t miss the fresh pasta, pesto, olive oil, marinated anchovies, lemon soaps and fragrances. Monterosso al Mare is one of the most picturesque cities in Italy. It is home to a castle, a cathedral and a beautiful beach. It is located in the middle of a small natural gulf, protected by an artificial cliff east of Punta Mesco in the La Spezia Riviera. It is the westernmost of the Cinque Terre. The city is divided into two distinct parts: the old city and the new city. The two areas are divided by a single tunnel that allows transit to pedestrians and very few cars in the city to move between the two areas. The beach of Monterosso runs along most of the coast and is well used by tourists and locals. The beach is the only wide, sandy beach of the Cinque Terre. For many adventurers, Monterosso al Mare is the starting point for the spectacular 12 km hiking trail that runs along the Cinque Terre coastline. Want to experience Cinque Terre for yourself? Join us in Italy and experience the best of the region!